You may want to pass on this fad diet! 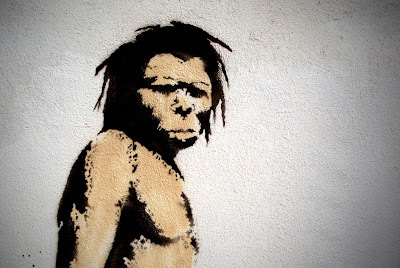 I've heard quite a few people talk about the Paleo diet, many of whom are athletes. Not surprising really. Athletes are always looking for an edge and for those who want to do it naturally, eating what they consider to be "a healthy diet" is a no brainer. And cavemen certainly appear to be trim, fit and strong, carrying around those big manly clubs and hunting for their food. The "Paleo Diet" was originally published as a weight loss book by Dr. Loren Cordain who subsequently targeted athletes in the book, "The Paleo Diet for Athletes". Quite simply, Dr. Cordain feels that the best diet for our general health and for optimal athletic performance is one that mimics that of our cavemen ancestors. It consists of food that can be hunted or gathered and is composed of lean, grass-fed meats, seafood, eggs, fruits, vegetables, healthy oil (such as avocado, flaxseed, etc.) , nuts and seeds. It avoids grains, legumes (including peanuts), potatoes, dairy, refined oils, salt, processed food, sugars and alcohol. Other than the health benefits of giving up processed foods, dairy, sugar and unhealthy fats, and consuming more fruits and vegetables, there are many reasons to pass on this diet. Here are a few of them. The suggested menus on the paleo diet website recommends meat at every meal. Diced turkey in your morning omelet, beef slices on your lunch salad and pork or fish with your veggies at dinner. This amounts to 21 meat meals per week or 19% to 35% of calories coming from meat. This compares to the 15% found in the average western diet. Eating too much animal protein can cause a host of problems. * Animal protein increases the acid load in our bodies. To neutralize this acid in the blood and tissues, calcium is pulled from our bones which can lead to increased risk of bone fractures. A high protein diet can have devastating results on bone health as it literally washes the calcium out of our body. * This causes the excessive excretion of calcium in the urine. Long term, this could lead to kidney stones and osteoporosis. * Too much protein can put a strain on the kidneys as it tries to eliminate the wastes from protein metabolism. Although there is debate whether or not this is a problem for healthy individuals, studies show that those with reduced kidney function would experience further decline on a high protein diet. Although the Paleo diet recommends lean, grass-fed, pasture-raised meat, only 1% of the meat sold ever saw a grassy pasture. The other 99% were raised in factory farms and do not have the beneficial fatty acids, like conjugated linoleic acid, found in grass-fed meat. And irregardless of how "lean" the meat eaten on this diet is, 21 meat meals per week could lead to too much saturated fat and cholesterol. I know you athletes out there will think that this won't effect you because you plan to "burn it off" but that attitude can take you down a slippery slope. Sometimes when we work out a lot we feel we "deserve" to eat whatever we want. In the case of the Paleo diet, that may equate to meat that's not as lean as the diet dictates. But the opposite is true. When you work out hard is when you should be providing the very best fuel for your body. So if you are eating lots of animal protein and, therefore, more saturated fat and cholesterol than you should, some of that cholesterol can end up in your arteries regardless of your workout routine. * Excess saturated fat in a diet is a major risk factor for heart disease. * High fat diets cause the build up of cholesterol in the arteries which could lead to stroke, cardiovascular and coronary heart disease. * The Dietary Guidelines for Americans recommends limiting saturated fat to no more than 10% of total daily calories and 7% to further reduce risk of heart disease. Beans are one of the healthiest foods you can serve your family. Not to mention a life without hummus, bean chili, and a salad topped with garbanzos is unimaginable! 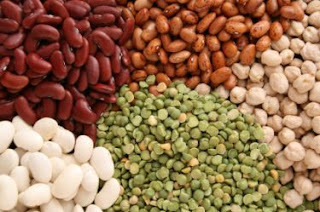 * Beans are an economical source of high quality protein that provides essential amino acid building blocks without the saturated fat and cholesterol contained in meat. * They are one of the most concentrated natural sources of the B vitamin folate and are rich in thiamin. Beans contain minerals such as potassium, zinc, iron, copper, phosphorous, manganese, and magnesium. * High in antioxidants, a half cup of dried small red beans has more antioxidant capacity than a cup of wild blueberries. * Beans are a excellent source of dietary fiber. * The Nurses' Health Study II linked the consumption of beans to a lower risk of breast cancer. * Soybeans, made into tofu, is an excellent source of calcium. One half cup of calcium set tofu delivers nearly 900 mg.
#4 - A Diet Without Whole Grains - Really? The Paleo diet avoids healthy grains such as brown rice, quinoa, 100% whole wheat, whole oats/oatmeal, barley, rye, buckwheat, cracked wheat (bulgur), popcorn, millet and sorghum. These are important foods and can contribute greatly to good health. * Whole grains provide healthy, complex carbohydrates. Carbohydrates are broken down into simple sugar during digestion and the resulting glucose is used as your body's main source of fuel (remember the good old days when we runners carbo loaded before that big race!). * The 2010 Dietary Guidelines for Americans recommends that carbohydrates make up 45 to 65 percent of our daily calorie intake. This is extremely difficult to do without the consumption of grains (and beans). 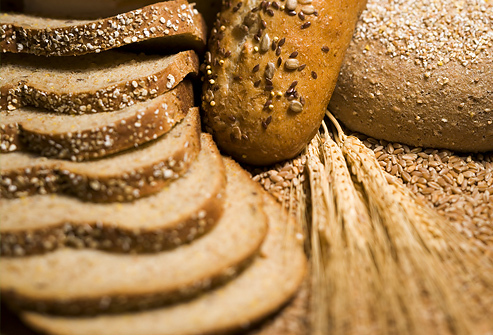 * Whole grains contain protein, fiber and antioxidants. * They are rich in B vitamins and minerals such as iron, zinc, copper and magnesium. * The consumption of whole grains has been shown to reduce the risk of heart disease, type 2 diabetes, obesity and some cancers. 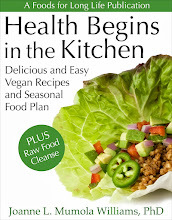 * Whole grains promote the growth of healthy bacteria in the colon which promotes bowel health. The Paleo diet brags about providing lots of fiber because it includes fruit and vegetables. However, without beans and whole grains it is very difficult to achieve a minimum of 25 to 35 grams per day, especially when 35% of the calories come from meat which contains zero fiber. For example, on the Paleo diet, even if you ate 1 cup of strawberries at breakfast, an apple for a snack, a cup of coleslaw at lunch, 3 cups of salad and a cup of cooked spinach at dinner (as an accompaniment to all the meat contained in each of your three meals), you would barely get 15 grams of fiber. A single cup of lentils, forbidden on the Paleo diet, provides almost 16 grams! A healthy diet must have adequate fiber. * Fiber is critical in bowel health. Insufficient fiber can lead to constipation, hemorrhoids, and diverticular disease. * A diet high in fiber helps control and stabilize blood sugar. This is particular important with people at risk for type 2 diabetes. * High fiber foods help you feel full longer and help control weight gain. * Soluble fiber, like that found in beans or oats, can help lower cholesterol. * High consumption of dietary fiber has been linked to lower risk of heart disease and colon cancer. Grass fed meat is very costly. Let's be realistic. How many people on this diet would be willing to spend $26 a pound for a grass-fed steak? Do you think most restaurants are going to? As I already mentioned, only 1 percent of the meat sold is raised on a pasture. The rest is factory farmed. So what does this mean? * It means that most of your meat meals, especially those eaten in a restaurant, will most likely be from factory-farmed sources. * Non-pasture raised meats are not as lean and contain more saturated fat. * Non-pasture raised meats may also contain growth hormones, antibiotics and toxic pesticides. Having the world convert to a diet with 21 meat meals per week is environmentally unsustainable. * Animal agriculture is already considered the greatest contributor to global warming and produces more greenhouse gas emissions that all of the planes, trains, ships and automobiles in the world combined. 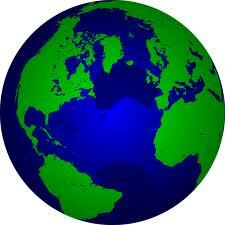 * Animal agriculture utilizes an enormous amount of the earth's land and water for pasture and growing feed for animals. It also drives deforestation for additional pasture land. Perhaps the biggest reason to not go on the Paleo Diet is because you don't have to. Believe me, if there were a Whole Foods available during the Paleolithic period, that cave man would certainly not have chosen this restrictive diet. In fact, if he were to beam himself down right now and saw people purposely avoiding delicious grains, beans and yummy baked sweet potatoes, he'd be scratching his head in wonder. Vegan Cauliflower And Peas On Barilla's White Fiber Mini Shells - Enjoy The Taste Of White Pasta With The Fiber Of Whole Wheat! 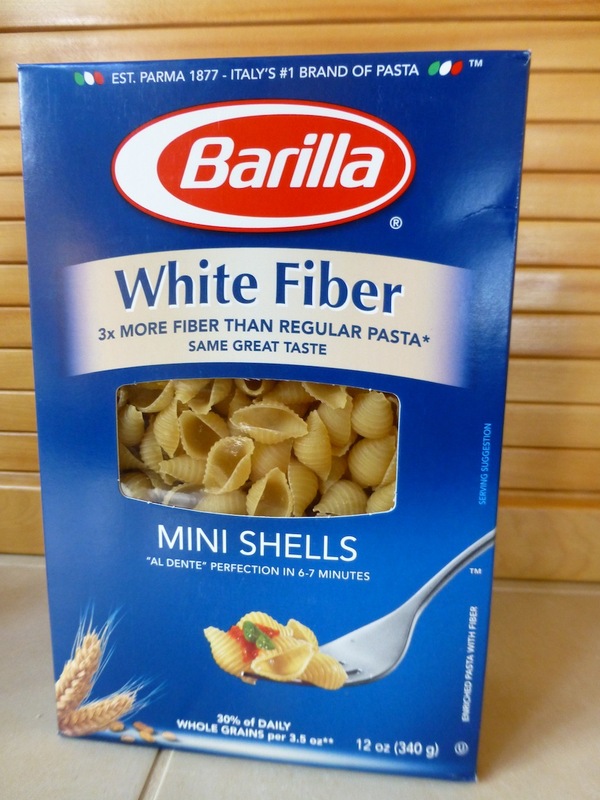 As delicious as white pasta with 6 g of fiber per serving! 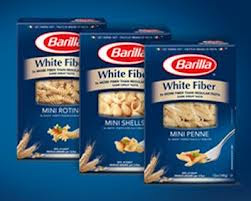 New and Exciting Products from Barilla! Getting sufficient dietary fiber in your diet is one of the most important things you can do for your health. For pasta lovers this means having to forgo the comforting taste and texture of semolina or "white" pasta when they opt for higher fiber, whole grain pasta. This is where even my most health conscious friends and family draw the line. But I recently discovered a new product from Barilla that looks, cooks, chews and tastes just like regular white pasta but has 6 grams of fiber per 2 ounce serving - the same amount that you would get from whole grain pasta. Semolina wheat (sorry, these are not gluten free), durum wheat flour, whole durum wheat flour, and corn starch. The fiber comes from the whole durum wheat flour and the "hi-maize 260" (which is listed as corn starch). Hi-maize resistant starch is made from corn that has been hybridized through a natural plant breeding program. It does not contain genetically modified material. After harvesting, the corn is milled and dried to a fine, cornstarch powder. This powder contains a "resistant starch" that resists digestion in the small intestine and behaves as dietary fiber in the large intestine. This pasta has a great taste and texture and besides the mini shells, it comes in mini penne and mini rotini. I wish it came in some other shapes and sizes - let's hope they are working on that right now! Here's a delicious and simple recipe that's under 300 calories per serving, provides 10 grams of protein and around one third of your daily requirement of dietary fiber. Fill a large pot with water and salt for the pasta and bring to a boil. Meanwhile, make the sauce. Heat 1 tablespoon of the olive oil in a large saucepan. Add garlic and red pepper flakes and cook on medium low heat until garlic is fragrant and slightly brown, 1 to 2 minutes. Always let minced garlic sit for 15 minutes before cooking to help it maintain its beneficial properties. Cut the cauliflower into very small florets so that is cooks quickly. Stir in the cauliflower florets to coat and add the juice from the can of peas, water, the bullion cube, the dried parsley flakes and the remaining tablespoon of olive oil. Stir to combine. Bring to a boil on high heat. Lower the heat, and stir until the bullion cube dissolves. Simmer, covered, until the cauliflower begins to soften, about 6 to 8 minutes. Cover and simmer until cauliflower begins to soften. While the cauliflower is cooking, prepare the pasta according to directions. Drain and set aside. When the cauliflower begins to soften, stir in the peas and cook, covered, until the cauliflower is tender, about 5 minutes. Add salt to taste. Stir in peas, cover and simmer. Stir in the cooked shells and serve immediately. Add the cooked shells and serve. Per serving: 299 calories, 8.5 g total fat, 1 g saturated fat, 115 mg omega-3 and 788 mg omega-6 fatty acids*, 0 mg cholesterol, 10 g protein, 49 g carbohydrates, 10.5 g dietary fiber and 546 mg sodium (not including salt added to taste). * Omega-3 and omega-6 fatty acids do not include any contribution from the pasta since that information was not available from the manufacturer. This blueberry tart makes a perfect Valentine's day dessert! I know, it's almost Valentine's day. I should be making something red, like chocolate covered strawberries or red velvet cupcakes. But I was inspired by the thought of whipping fresh blueberries and cashews into a creamy filling served in a simple raw crust made from heart healthy English walnuts, dried coconut and chocolate in its purest form - raw cacao. Is there a better way to say, "I love you" than giving a gift of delicious and powerful antioxidants? I don't think so. This recipe makes enough for one 4 1/2 inch tart pan with enough crumble and filling left over for 2 small ramekins. A tart makes a very elegant presentation. But if you don't have a tart pan, feel free to use individual ramekins or small bowls for the entire recipe. Sprinkle the crust ingredients in the bottom of 4 to 6 individual ramekins or small bowls and cover them with the filling. It tastes just as delicious! Don't have a tart pan? No problem. Just sprinkle the crust on the bottom of individual ramekins. Cover with blueberry filling, top with a blueberry and serve! Prepare the crust. Place the crust ingredients in a food processor, such as a Cuisinart, fitted with an S-blade. Process until they form a "chocolate crumble" and are the size of bread crumbs. The will begin to stick together. Place enough chocolate crumble into a 4 1/2 inch tart pan to cover the bottom and the sides. Press with your fingers to make a crust. You should have enough to sprinkle the bottoms of 2 small ramekins. If you do not have a tart pan, divide all of the crumble into four to six small ramekins. Press enough of the crumble to cover the bottom and sides of a 4 1/2 inch tart pan with a removable bottom. Sprinkle the rest in the bottom of 2 small ramekins. You can use all ramekins if you don't have a tart pan. Place the cashews, dates, blueberries (reserving 8 for the garnish) and stevia in a high speed blender, such as a Vitamix or a Blendtec. Blend until smooth, scraping down the sides as necessary. Spread the filling over the crust and garnish with fresh blueberries. Spread the remaining filling over the 2 individual ramekins and garnish each with a single blueberry. Cover gently with plastic wrap or was paper and refrigerate for one hour. Carefully push the tart up from the bottom and remove the side pan. Enjoy! Release from tart pan and serve. You may notice that it's almost impossible to get all of the filling out of your Vitamix. I just hate wasting all of those beautiful ingredients. So make a small smoothie! Add the date soak water and a cup of almond milk to the blender with its residue filling. Blend until smooth and enjoy!